A few weeks ago we had my youngest’s birthday. She turned 5, which I seriously can’t believe. I made two different pasta casseroles for our party. 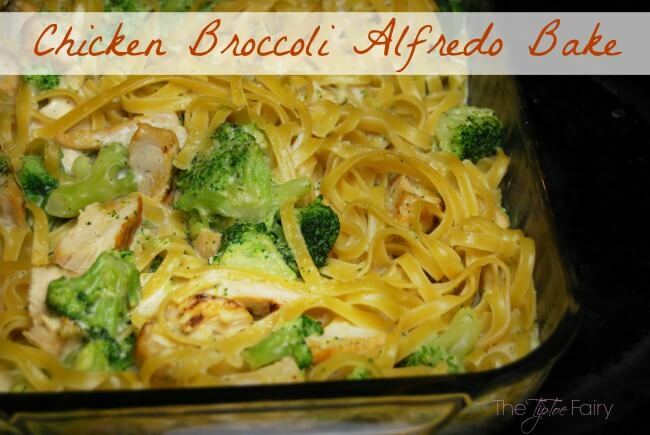 The first one, Chicken Broccoli Alfredo Bake, I shared a couple weeks ago. 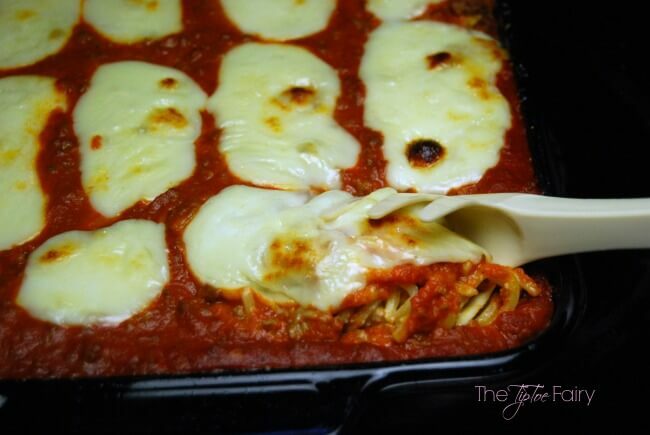 Today, I’m sharing the second one, Baked Spaghetti Casserole – it’s my personal favorite! This is a pretty quick and simple casserole. First you’ll need to cook the spaghetti and brown the ground beef. For the pasta, this meal will work with just about anything from shells to linguine – whatever is in the pantry. Once the meat is browned and drained, then add the sauce and let it simmer for 10 minutes or so. Then, add 1/4 cup of cream and stir it slowly until well mixed. Keep it warm on low while you prepare the spaghetti. Drain the spaghetti but don’t rinse it. You want it hot to melt the butter and cheese. Throw in the butter and mix it up until it’s melted. Let’s rewind a second so that back when the water was boiling, you should mix up the eggs and Parmesan cheese. 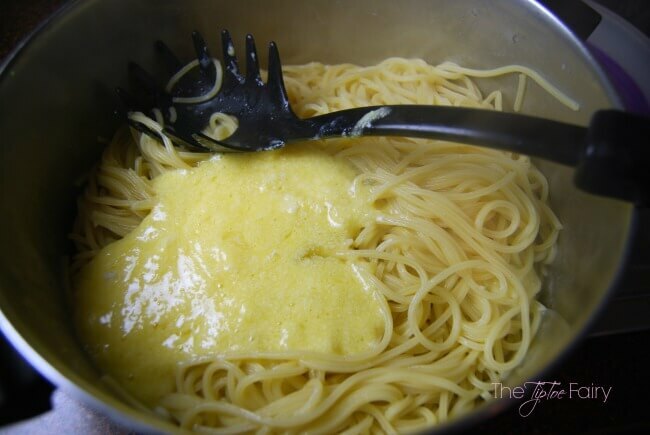 Then, after the butter is all melted, pour the egg/cheese mixture over the spaghetti and mix it in. Now you’ll add the ricotta cheese and cream cheese. You can also use cottage cheese in place of the ricotta. I’ve used both, and it really just depends on what’s in the fridge as to whether I use one or the other. 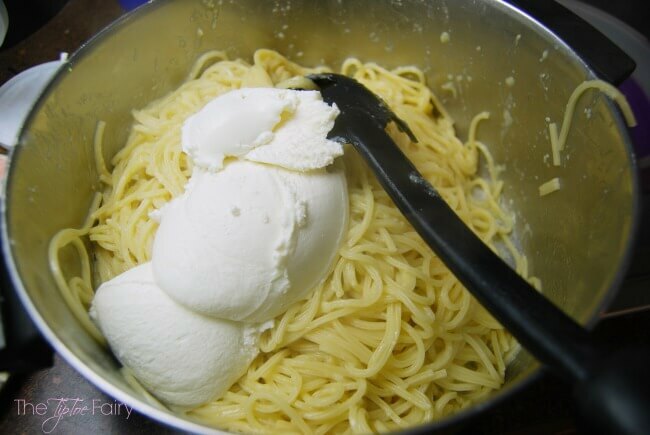 Now that all the cheesy goodness is mixed in, add the spaghetti to the casserole dish. If you like a little heat in your spaghetti, sprinkle about 1/2 teaspoon of red paper flakes all over the spaghetti. Next, pour the meat/sauce mixture over the spaghetti, but don’t mix it in. Some of it soaks into the spaghetti as it bakes, but it also forms a delicious layer on top of the spaghetti, like spaghetti pie. Lastly, top the dish with sliced mozzarella. This is the fresh, wet mozzarella that tastes so wonderful on pizza. You can buy it presliced in a loaf or ball. Preheat oven to 350 and put spaghetti on to boil. Spray a 9 x 13 pan with olive oil spray. Add spaghetti sauce to meat. Once it’s simmering, add cream and stir until well combined. Combine eggs and Parmesan cheese, set aside. Cook spaghetti and drain. 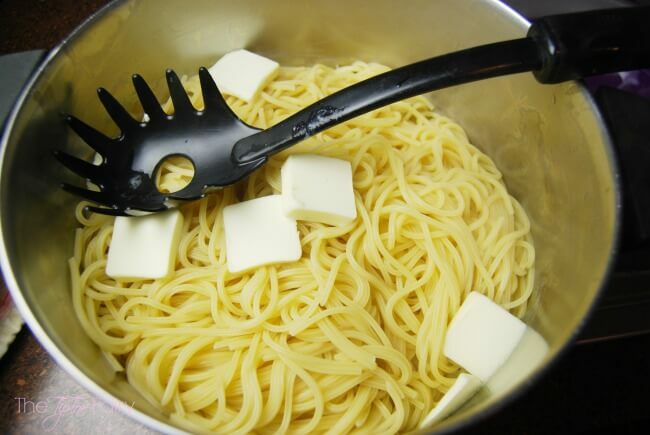 Immediately add butter to the spaghetti. After butter has melted, add the egg/cheese mixture and the ricotta cheese. 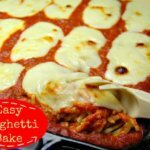 Add spaghetti to casserole dish. Then, sprinkle red pepper flakes over the spaghetti – this is optional! 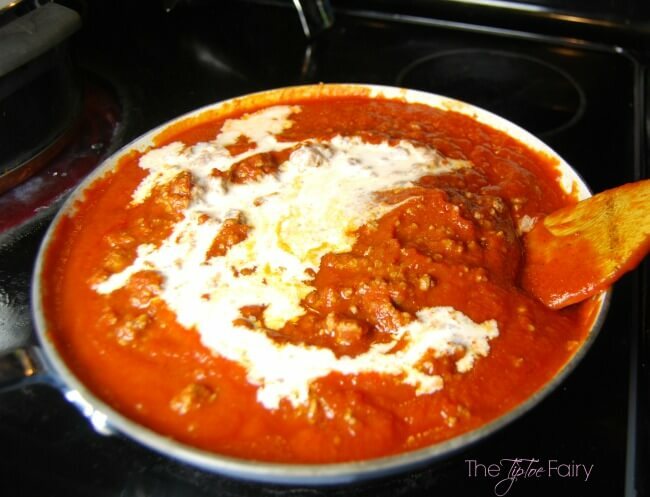 Pour meat sauce over spaghetti, do not mix it in. 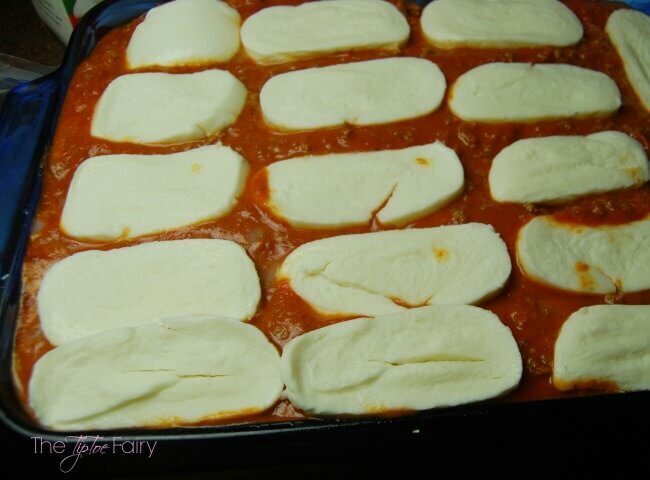 Lay the slices of mozzarella over the entire casserole. Bake for 45 minutes. Turn the broiler on for the last 3-5 minutes to brown the cheese just a bit. When it’s almost time to pull it out of the oven, turn the broiler on for just a few minutes. But, make sure you watch it, or you can end up wtih some very burned cheese. I usually let it go for 2-4 minutes. This is one of those dishes my family loves. It’s the ultimate in comfort food. I used to love mac n cheese as my fave, but this casserole has turned into my absolute favorite in comfort food. A bowl of this casserole, a rainy day, and a Netflix binge is my kinda party. I’ve shown you my favorite comfort food. What’s yours? 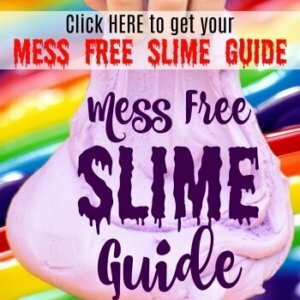 Gets Your Kids Brushing with Firefly! Pasta is one of my biggest weaknesses! I can eat it hot or I can eat it cold. It’s amazing. That sounds SO good! I wish I had some right now. My mom always made casseroles growing up, but none of them looked this amazing. I know my family will adore this recipe. 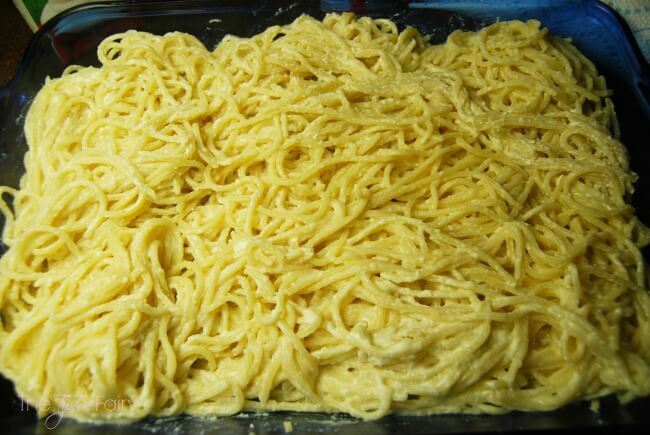 This was a family favorite when the kids were growing up, turkey tetrazzini was another one. Looks so yummy. I haven’t had baked spaghetti in ages. Definitely giving this recipe a try. Thanks for sharing! Yum! 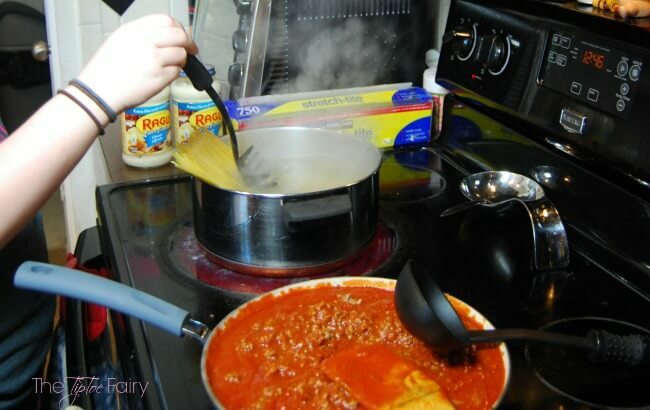 My boys love spaghetti, but I’ve never tried serving it to them this way. I’m going to have to put this on the menu! Oh my gosh that looks delicious. I love fresh mozzerella on top. 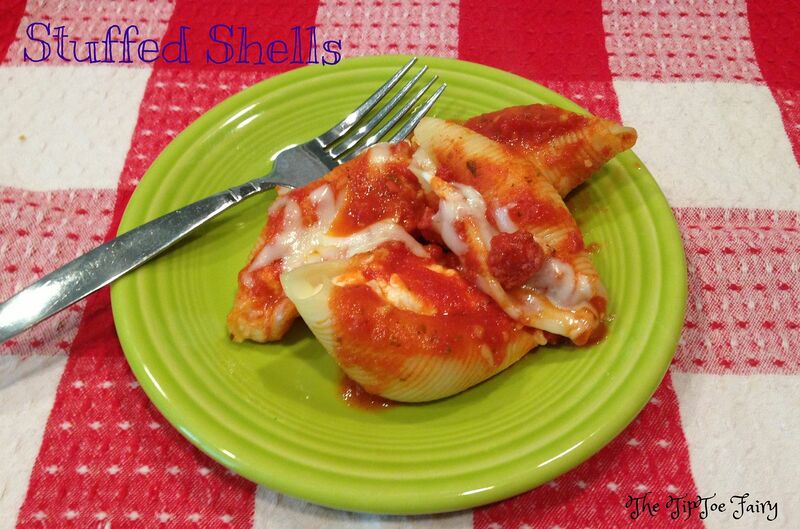 I agree – that wet balled mozzarella is s good! I use it in buffalo salads. Looks warm and welcoming Stephanie! Especially on these cold and wintry days! Pinned and shared! Oh man, this sounds amazing! My girls would love it! I love pasta. And I love this dish because it’s baked! I am loving the mozzarella. 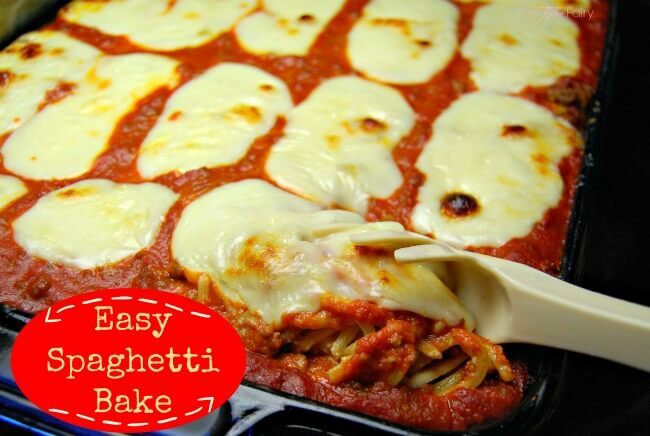 This is just a wonderful baked spaghetti casserole. It makes me hungry.